Phuket is one of the world’s most beautiful resort islands with a natural backdrop of lush green hills, palm fringed beaches the warm blue waters of the Andaman Sea. 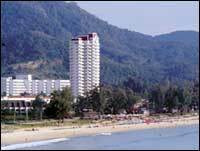 Of these beaches Karon Beach is especially enchanting. - Credit Card details are required to guarantee the reservations. - Check-in time is 2 pm. an overnight rate will be charged to guarantee check-in before 2 pm. - Check-out time is 12 noon on the day of departure. Late check-out is subjected to availability and will be charged at 50% room rate if check-out prior to 6.00 pm and after 6.00 pm at full rate. - In case of cancellation, a written notice must be received by the hotel at least 7 days prior to the guest arrival. - In case of no show or failure cancellation, a full amount of the total night stay will be charged. Central Waterfront Suites comprise of elegant and spacious one and two-bedroom apartments of 88 and 133 square metres of living space respectively. The design of these exclusive self catering “vacation homes” is such that it affords pleasant living combined with glorious waterfront views.Both one and two-bedroom apartments include a kitchen, dining and living rooms, as well as outdoor balconies with panoramic views over the finest beach of Karon. Watersports are the main focus at Karon. Swimming, sailing, water skiing, windsurfing, snorkling and scuba diving, deep sea fishing, para-sailing and much, much more. Or you can simply relax on the beach and be caressed by the cool sea breeze or do absolutely nothing at all. Facilities on the premises are a Fitness Centre, tennis and squash courts, as well as an enticing outdoor Pool. Just minutes away are superb international golf courses for golf enthusiasts.